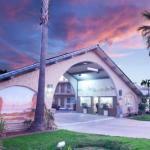 Seconds off the freeway with free Wi-Fi and parking the Stardust Inn I-805 Naval Base where pets are welcome for a fee is convenient and cost-efficient. This cozy two-story motel has just 35 rooms. They're uniquely furnished with murals on some walls and balconies on the upper floor. Rooms are accessed via exterior corridors. All guests enjoy free Wi-Fi a mini-fridge microwave desk and cable TV. Parking is free. The hotel is directly off I-805 about seven miles southeast of downtown San Diego. The 32nd Street Naval Station is less than three miles away as is the Westfield Plaza Bonita Mall featuring a play space movie theater stores and restaurants. The San Diego Zoo is a little more than eight miles away and Petco Park Baseball Stadium is seven miles away. The San Diego Convention Center is 15 minutes from the hotel. San Diego International Airport is 10 miles away.